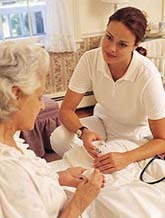 A comprehensive, homecare agency consisting of Visiting Nurse Services, Good Samaritan Hospice Care, and Lifespan Home Medical Equipment, Lifespan, a wholly-owned subsidiary of Battle Creek Health System, is a regional, integrated home care delivery system offering patients high-quality, cost-effective homecare. Lifespan serves the counties of Barry, Branch, Calhoun, Eaton, Hillsdale, Jackson and St. Joseph. Lifespan is accredited by the Joint Commission on Accreditation of Healthcare Organizations. Lifespan is governed by its own Board of Directors, who hire and direct the President/CEO and provide continuing direction for planning, operation and evaluation of all programs, services and related corporate activities. The Board is comprised of community-based leaders who volunteer their time and expertise to Lifespan.